La maison des Jackson est sur la gauche. The Jacksons' house is on the left. Le livre de Paul est sur son lit. Paul's book is on his bed. Le jouet de l'enfant est cassé. The child's toy is broken. Les notes d'Aurélie sont bonnes. In English, to express possession, we use the 's for example Tara's bag. There is no equivalent structure in French: instead, we use de or des (of). - the object comes first and the owner last (the reverse of English). It's exactly the same as in Old English. - you need to add the definite article le, la, l', les before the first element, as in French you cannot have a noun without an article. L'histoire de Marie est extraordinaire! Le jouet de l'enfant is the toy of a particular infante (hence the definite article). L'office de tourisme is the tourist office in general, not of "the" tourism. Tysm for taking out tym to answer the question Chris and the lawless team. In the first example, can I say 'La maison des Jackson est à gauche.'? "La maison des Jackson est à gauche" also for on the left. In first example" La maison des Jackson est sur la gauche." I believe this has been answered by Aurélie earlier, do you have another question? Je me demande, n'est-ce pas la même chose en anglais? "as in French you cannot have a noun without article." ou "without an article"? In English both options -- with or without "an" -- are possible. Actually, no 'an' was missing here. I've corrected the lesson. Un stylo est à moi Un stylo est de moi? That's a good question, April. Somehow I've managed to get a feel for it which I'll try to put in words. "De" is used to denote intellectual ownership while "à" implies personal physical ownership. It is often translated as "by" in this context: "Ce livre de Zola est excellent." -- This book by Zola is excellent. "De" is also used to describe an object further. In these instances one could translate "de" with "of the": "La balle des enfants." -- The ball of the children. "À" really expresses ownership in a more direct sense as "de". "Ce manteau-ci est à moi." -- This coat belongs to me. I hope I was able to shed some light on this. -- Chris (not a native speaker). Looking at the two sentences from your question: Le stylo est à moi -- The pen belongs to me. Le stylo est de moi. -- The pen is by me (i.e., I made it) The first one sounds very natural to my ears, whereas the second one doesn't. -- Chris. Ce cadeau est de moi = This gift is from me. For possession you could only say, Le stylo est à moi. When is it appropriate to use d’ instead of de? You use "d'" whenever the next word starts with a vowel. This works for all words ending on the letter "e" when the next word starts with a vowel and is called elision. Here is the corresponding lesson: https://progress.lawlessfrench.com/revision/glossary/contraction/l-elision-elision -- Chris. Attention! Chris is correct about elision BUT it does not apply to "all words ending in -e", but only pronouns and prepositions (you cannot apply elision on nouns or adjectives for example!) Bonne journée ! Yes, thank you, Aurélie. I forgot about that. To augment this with an example: "Notre évaluation va commencer tout de suite." and NOT "Notr' évaluation.....". -- Chris (not a native speaker). Thanks Chris! Spanish has always been my area of expertise and I thought why not take a shot at French. 2- The "child" element is characterising the type of room, but doesn't indicate who specifically owns that room = the nursery / "the child room"
Bonjour Sara ! The "verbes du deuxième groupe" in French are regular -IR verbs which follow the conjugation of "finir". They're characterised by an "-iss-" suffix in the plural forms of Le Présent: "nous finissons, vous finissez, ils/elles finissent" I hope that's helpful! Bonne Année ! Bonjour Nazanin, Good question. No, because "de" is not possessive here: it's not saying that the "apple" belongs to the ground, it's describing where it comes from. Bonjour Nazanin ! Here you are not saying "the apple of THE earth", which would imply a possession by one of the other, but more "the earth apple" which is a general characteristic of that kind of apple. Therefore, you will not use the definite article "la" which makes it a specific case ("of THE earth"). 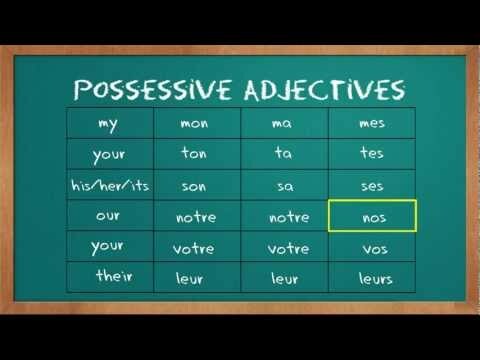 Here it's not a case of possession, but rather a case of characterisation, such as explained in the following lesson: https://progress.lawlessfrench.com/my-languages/french/view/207 I hope that's helpful!